Algona's Louis Sullivan-designed building, one of only eight such architectural masterpieces in the Midwest, is listed on the National Register of Historic Places. This historic building is home to the Algona Area Chamber of Commerce. Commissioned and built in 1913 by Algona businessman Henry C. Adams as a land and loan office the structure, located at 123 East State Street, has been the object of architectural interest for decades. 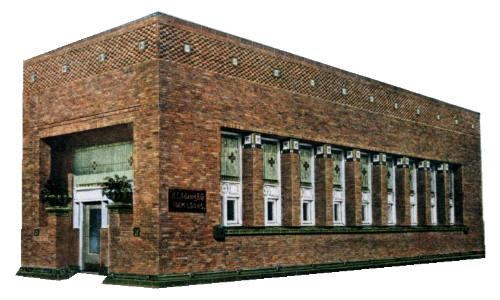 Adams hired Sullivan, whose most famous pupil was Frank Lloyd Wright, at a time when Sullivan had branched into designing rural banks. Between 1906 and 1920, he designed eight such Midwest facilities. The Algona building is featured in numerous textbooks and studies. One of Sullivan's best-known works is the Carson Pirie Scott department store in Chicago. Adams sold the building in 1921 to Al Falkenhainer, founder of Druggists Mutual, now Pharmacists Mutual. The company remained there until 1971, when it moved to its present location north of Algona on U.S. Highway 18 West. The building had several retail tenants prior to the agreement between the Sullivan Foundation and the Algona Area Chamber of Commerce. Renovation of the interior continues with plans to complete the building back to its original design.